David West and Tristan Thompson gets too close during the Game 5 of NBA Finals on Monday, June 12, 2017. 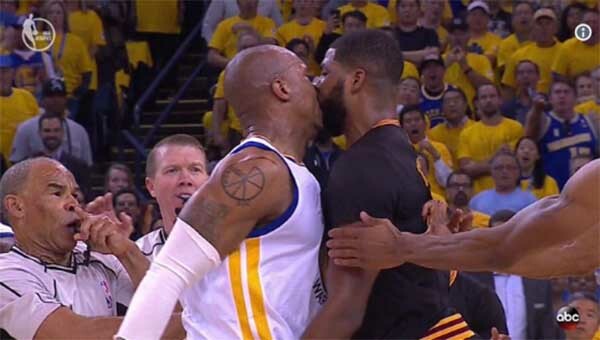 Internet roasted David West and Tristan Thompson after getting too close during the Game 5 NBA Finals on Monday. Trolls flooded the social media after the two share a kiss during their altercation in second quarter. Here’s what netizens have to say about the incident. Meanwhile, the Golden State Warriors wins the NBA Finals 2017 championship series — the team emerged victorious by defeating the Cleveland Cavaliers in the Game 5 held at the Oracle Arena on Monday with 129-120.